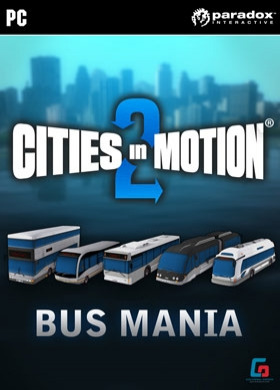 NOTICE: Requires the base game Cities in Motion 2 in order to play. Activation key must be used on a valid Steam account, requires internet connection. ABOUT THE GAME	Want more buses? Here they are! The Bus Mania pack offers five all-new bus type vehicles to spice up the game. Try out these modern vehicles to make the most of your routes, or build new lines with brand new vehicles for the citi… zens to marvel at.KEY FEATURES Pavlov Arriva: Do you have a line with hard to please customers? Pavlov Arriva is small, smart and very comfortable to ride. Passengers are sure to flock to this one! Comet Sun: Pretty average in every way. Not the best slogan, but the Sun is a well-rounded vehicle with decent capacity and speed. Decent for almost any route! Maurice Automaton: When your maintenance capacity is under a lot of stress, Maurice Automaton is the vehicle to choose. It has a sturdy structure and a low maintenance need, making it perfect for busy inner city routes with short intervals. Arnauld 202: Need more capacity? The Arnauld 202 has lots of room and then some! It's very slow, but with the large capacity still very useful for routes with lots of passengers. Stern-Berger ProTerra: Not many passengers fit into a Stern-Berger ProTerra, but its energy consumption is so low it basically runs on air! This small but powerful vehicle is the top of the line when it comes to eco-friendly inventions.SYSTEM REQUIREMENTS Windows Operating system: Microsoft Windows XP/Vista/7/8 Processor: 2 GHz Dual core Memory: 3 GB RAMHard Drive: 2 GB free hard disk space Video: nVIDIA GeForce 8800, 512 MB RAM or ATI Radeon HD 3850, 512 MB RAM DirectX®: 9 or aboveMac Operating system: OSX Snow Leopard 10.6.3 Processor: 2 GHz Dual core Memory: 3 GB RAM Hard Drive: 2 GB free hard disk space Video: nVIDIA GeForce 8800, 512 MB RAM or ATI Radeon HD 3850, 512 MB RAM Linux Operating system: Ubuntu 12.04 LTS Processor: Intel Core Duo Processor (2GHz or better) Memory: 3 GB RAM Hard Drive: 2 GB available space Video: nVIDIA GeForce 8800, 512 MB RAM or ATI Radeon HD 3850, 512 MB RAM Additional: GLSL 1.3, OpenGL 2.1. Paradox Interactive, CITIES IN MOTION® Copyright©  Paradox Interactive AB All rights reserved.